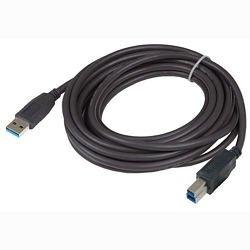 Connect USB 3.0 ("SuperSpeed") devices to USB 3.0 computers with this device cable. Designed specifically for the USB 3.0 plugs and sockets, it can carry 5 gigabits per second, ten times faster than USB 2.0. Please note, cannot be used with USB 2.0/1.1 devices.